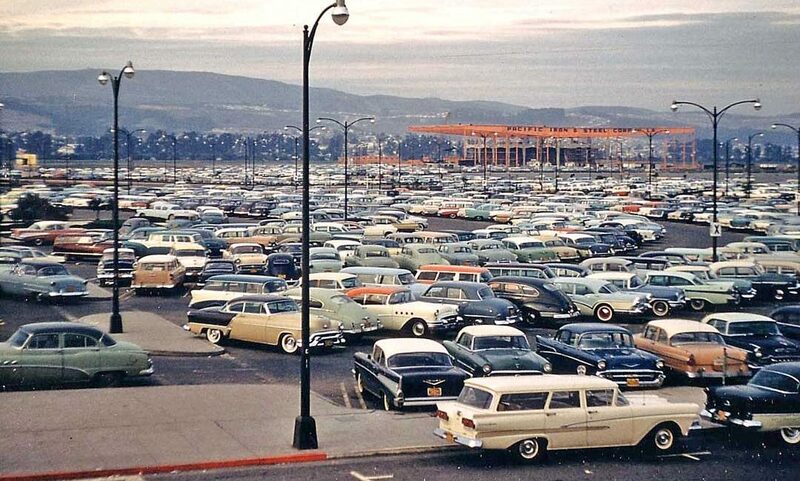 The majority of the photos in the “Parking Lot Series” are black and white and it is rare to find a “Kodachrome” image taken in the late 1950s of this quality containing such a large number of automobiles. The California license plates and the “Pacific Iron & Steel Company” advertising on a beam at the top of the orange building framework being erected in the background are the only clues to the location of this parking facility. An internet search for this picture ended without any results, which may mean that a private individual took this shot. Share with us what you find of interest in the scene or if the location can be identified for the enlargeable photograph (below) found by contributor Benjamin Ames. This entry was posted in Auto photos 1946 - 1965 and tagged 1950s, 1950s Automobiles, California, Pacific Iron & Steel Company, Parking Lot Series. Look at the kaleidoscope of colors! Unlike today, there’s very few black, white, gray or silver cars and I see only two foreign made cars – both Volkswagens. I sorta miss those days – well except for the fuel mileage, safety and reliability of cars of that era. I think there is a cream or white Karmann Ghia near the X. I don’t see any Dauphines but I bet there’s one somewhere out there. Gotta love that two tone 1953 Olds 98 Holiday hardtop. That’s the one that caught my eye! On the right, 2nd row in, is a gray over white 1957 BUICK Special, non-hardtop. In the foreground, on the far left, is a dark green over lime green 1952 BUICK Special. In a sea of color this picture shows how popular two-tones were. But to pick my favorite it would be the ’57 Dodge in the second row. Look how low and sleek this “swept wing” Dodge was in comparison to others in the parking lot. Thanks to the talents of VIrgil Exner. Bob, I too am a huge fan of Exner and the Forward Look. To really see just how big a revolution the Forward Look was you only need to see the 52 Plymouth 4 cars to the left of the Dodge. I see an oval-window VW! Probably a 57, since it’s a one piece, not the divided oval. Off on the left side, a dark brown ’50-’52 Nash Rambler wagon. In addition to the ’57 Buick AML spotted up front, I think I see another one in pale yellow facing us above the ’53 Olds Gene spotted, and a third one, a grey Super or Roadmaster 4-door Riviera seen in profile a bit further up and to the left. Behind the black and white ’56 Chevy wagon on the left could possibly be a ’55 or ’56 T-bird…it’s low enough but where the rear exhaust ports would be is blocked from view. I see a black and white ’55 or ’56 Crown Victoria on the extreme left. I would expect a ’56 Fairlane’s side trim would be visible on the driver’s door (a ‘55’s would not) but in any case the rear quarter trim appears to be the wider trim of a ’56. In the 4th row from the front, on the right [parked between white over lime green 1954 BUICK and a white over black 1956 BUICK], is a yellow 1953 KAISER. 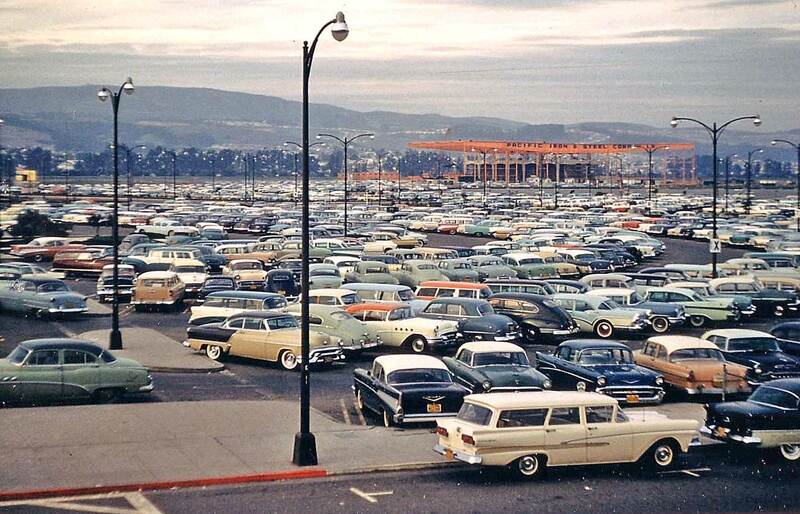 I see a great number of ’57s and the Ford wagon right up front appears to be the newest in sight: a ’58 . So the picture must either be around that time, with most of the workers making enough to drive late-model cars, or else it could be early ’60s with the workers driving older cars. Truly an excellent find. I was just thinking today, as website moderator myself, I realize how much work goes into updating a site every day. Thank you for all you do. Hi Richard, you think this was their yard? I think it’s a stadium or airport under construction and the Pacific Iron and Steel banner is just advertising for the company doing the work. Good point, Howard. It never occurred to me. I guess the mountains and the banner swayed me that this was their parking lot. I can’t say this was in Oxnard for two reasons. The first is I’ve been to Oxnard many time over many years and I cannot place a mountain range close to that city. The second is I don’t think there would this many employee cars for a steel company and therefore I think this parking lot is for an arena, stadium, amusement park or a ball park. You can see on the right most light pole an ‘X’ marking the area of the lot! This lot must bigger than the picture shows. Lots of good looking wagons. What is the coupe to the left of the X sign, may be a Willys? I think that must be a sports venue of some kind, but I have had no luck pinpointing it. Someone will before too long. Striking is the absence of many independent make cars, other than the maroon Nash Rambler wagon and a yellow Kaiser, I ‘ve yet to find a single Studebaker, Hudson or Packard. Indicative of their slipping acceptance perhaps? Isn’t that a Nash Rambler station wagon behind the 56 Ford behind the light post on the left side of the page? Oops. I missed that you caught the Nash. In the center a red/white 57 Chevy, a blur/ white 56 Chevy on far left and in back of it with its backdating the camera, a tan 55 or 56. A dark Nash wagon to the left. Nearby, a blue/white 55/56 Ford (Sorry, don’t know the trim that well, but I’ll guess 55). But wagon central seems to be the third row from the front. Many wagons there, to the right, the tops of two 57/58 Ford’s,one black, one white, are hidden by being so low. And if course, the best 58 in front. It looks like it could be San Francisco International Airport … San Bruno Mountain?? Just guessing … I think Pacific Steel and Iron was also across the bay In Berkeley . I may be totally wrong ……. I am 75 years old and can identify each and every car and year in the photo. Couldn’t do it in today’s parking lots as they all look alike. In 1957 all of us kids made a practice of checking out car dealers and parking lots and quizzing each other, and we were never bored. Guys, it’s SFO (San Francisco) looking westward toward Pacifica with the “ticky-tacky little boxes” homes of Daly City and San Bruno on the ridge lines. The steel structure is a parking garage under construction with the old circular SFO Hilton seen behind it next to then 101/Bayshore Highway. All, including the parking lot are long gone thanks to the many iterations of the airport since then. Ironically a new multi-story (Hilton?) hotel is being erected on the same hotel site at this moment. Pacific Iron & Steel was based in Alameda, CA, though certainly may have had branches elsewhere.